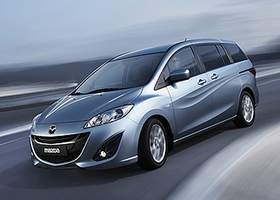 A set of wavy ridges on each side of the new Mazda5 is part of the brand's Nagare design philosophy. LOS ANGELES -- Mazda will debut the redesigned 2011 Mazda5 compact minivan at the Geneva auto show in March. The Mazda5 will be the first production vehicle that uses the Nagare, or "flow," design philosophy teased in several Mazda concept cars over the past three years. Functional interior ideas include multiple seat arrangements and a second-row center seat that can be converted into storage space. The Mazda5 will reduce carbon dioxide emissions 15 percent thanks to a direct-injection gasoline engine and the introduction of Mazda's “i-stop” start-stop technology. The new Mazda5 will go on sale across Europe later this year.